The industrial biotech pioneer is increasingly limited in its financial flexibility. This (probably) won't end well. 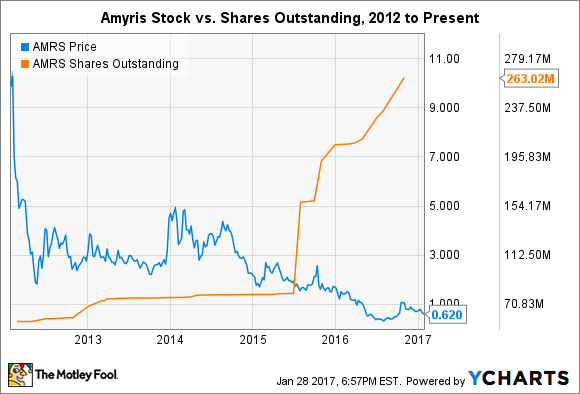 For a moment last year, it appeared that Amyris (NASDAQ: AMRS) shareholders were finally going to see their patience pay off. The stock climbed from around $0.30 per share to over $1 per share just in time to stave off Nasdaq de-listing it from the exchange. Then, just as abruptly, the stock began sliding back under the $1 mark. A declining trend for the stock coincided with a sharp uptick in short interest, as traders pounced on a relatively high share price for another crack at some easy profits. While the last earnings call seemed to show signs of progress, and management is promising big growth in 2017, investors are still betting big against Amyris. Here's why they're right. Short sellers have piled on after price run-ups in the past, but the stock was nearly 300% higher the last time more than 5 million shares were shorted. Today, the stock sits in the $0.60 range and nearly 5.3 million shares are short. Poor management decisions, production issues, high production costs, and the difficulty of scaling biology have all combined to breathe confidence in traders in recent years. Those factors still persist to this day, but another has come into play in the past 18 months: runaway dilution. Since mid-2015, the number of shares outstanding has exploded from just over 80 million to 263 million. Only 48 million are available after subtracting those owned by institutional investors and collaboration partners, which means 12% of the float is short at the moment. What happened? The chain reaction of dilution was set off by an enormous debt rebalancing act in the summer of 2015, in which financiers agreed to convert debt into stock. Management had hoped that expected production increases soon afterwards would provide enough firepower to refinance the remaining debt at more favorable interest rates. But production increases never materialized and product revenue never grew fast enough to bail out the company from its toxic balance sheet. Revenue totaled just $34 million in 2015 and $45 million during the first nine months of 2016. By comparison, interest expenses alone totaled $78.8 million and $26 million during the same periods, respectively. Unfortunately, Amyris is financially stuck. It can't access loans at favorable rates or offer additional debt notes, since potential buyers fear the company could end up in bankruptcy. The only way to obtain a quick cash injection is to offer more shares. The problem is that as more shares are offered, each one becomes worth less, which means more shares have to be offered to raise the same amount of money in the future. It has become a dangerous positive feedback loop with few, if any, solutions. Indeed, the CFO recently left the company. Production boost on the way? In what has become a quarterly ritual now, management has promised that the pieces are in place to enable big production gains. In November, the company said it was running its sole manufacturing facility at full tilt -- even skipping its annual shutdown period in January -- to satisfy demand from customers. The income statement and average production costs said otherwise, but management pointed to a record level of quarterly revenue as proof. The devil is in the details. While Amyris reported $26.5 million in revenue for the third quarter of 2016, approximately $20 million could be tied back to a one-time payment from a single collaboration partner. Worse, the growth in production costs exceeded an impressive gain in product revenue, which means the company is losing more money to manufacture more goods. Dismal record of management promises aside, investors were told to expect roughly $200 million in revenue in 2017. That would far exceed recent annual totals. Of course, I think investors are right to take a wait-and-see approach before blindly believing the company further. Short sellers are betting that Amyris will fall shy of the lofty expectations it has set for analysts and investors. Given the high levels of debt on the balance sheet and very negative cash flow, failing to drastically increase production -- and do so profitably -- would result in some uncomfortable changes for the company, perhaps even bankruptcy. 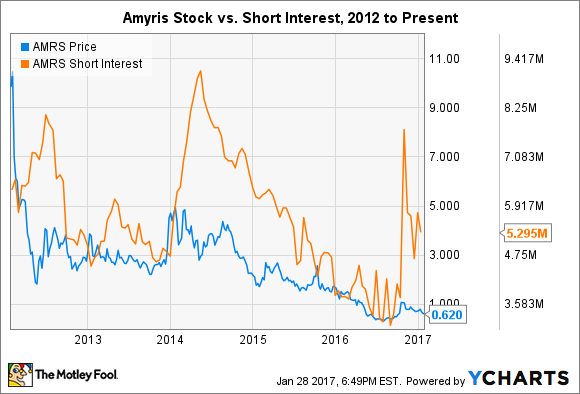 Short sellers are right, and you would be better served staying away from Amyris stock.